Bjarki might have met his match. The pup is just a biting bundle of energy, and today they were both play play play all day long. She only took a couple of little power naps, and always wanted to go outside for more. She’s doing pretty well on the don’t chase the chickens front, which is good, because as the snow keeps melting, any spot of bare ground that shows up has chickens on it, pecking and scratching away. When she got tired, she wanted to just sit on the deck and watch the world go by, and had zero interest in coming inside the house. It was a lovely day, though, hovering around the freezing point, blue skies. There’s supposed to be more snow and maybe rain tomorrow, so I’m glad they got a chance to burn off some energy out there today. They are so much fun to watch. 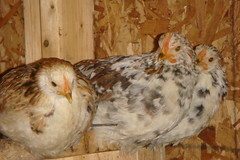 The chicks from both sets of hatches are mostly on their own now. We will often find the whole lot of them wandering around parentless these days, and they are all sleeping on their own now. A few can make it all the way up to the roost, but most of them are sleeping on the edge of the nest box, without the mamas. I’m going to decide that the mamas know what they are doing, and declare evening chickie drama to be over. 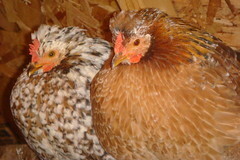 There is only minimal squawking and whining, so I guess the chicks are resigned to sleeping without the mama blanket! Poor things. I did lots of kitchen stuff today. I’ve got cream cheese and yogurt making from raw milk. I’m trying an Alton Brown Overnight Cinnamon Roll recipe. I’ve got a fancier than usual bread starter going for bread tomorrow. I’m doing a lamb with black bean sauce Chinese dish with leftover lamb from yesterday, with brown rice and broccoli. Frank’s running all the errands in town today by himself, so we don’t have to leave the puppy at home in the crate for that long. He’s picking up day-old bagels for the pigs, as well yeast from the brew pub. I’m going to try mixing it with shredded beat pulp to give it to the sheep. It’s very high in B vitamins, and supposedly good for parasites as well. He’s going to Agway to look to see what other water options they have for the pigs, since they’ve completely broken the tank heater he put in their trough. I wonder what we’ll try next. Doing all of the evening chores by myself really isn’t too bad. I split a bale of hay between all of the sheep pens, top up everyone’s water. Those hose never did work today, though, so hauling buckets wasn’t much fun. I bring a full bale out to the horses, and spread it out on a bare patch of snow. I bring in their grain buckets, so we can fill them inside the house in the morning. That sweet feed we are still using freezes into a solid block, so we have a bag in the house now. The pigs needed a couple of buckets of water, plus I brought them out some kitchen scraps. I think they’ll need some more hay in their palace tomorrow, and we need to come up with another attempt at something to block the doorway opening. Between their rolling around and the chickens scratching at the hay, quite a bit of it is ending up in the doorway, outside the shed, where it is not very useful. I checked all the nest boxes for eggs in the coop, plus counted tushies, topped up their feeder, closed the door and hatch door. Really, it’s only about a half hour to get it all done, and the pups follow me around the whole time. I like being out there with the critters, even in the cold. This entry was posted in Chickens, Dogs, Farm Life. Bookmark the permalink. Post a comment or leave a trackback: Trackback URL.